Surrounded by imposing mountains at about four hundred metres above sea level in the Valle Peligna, Sulmona is a charming secluded and somewhat overlooked small city in Abruzzo. Is is located on a plateau once occupied by a lake that disappeared in prehistoric times. The first mention of Sulmo occurs in the Second Punic War, when its territory was ravaged by Hannibal in 211 BC. 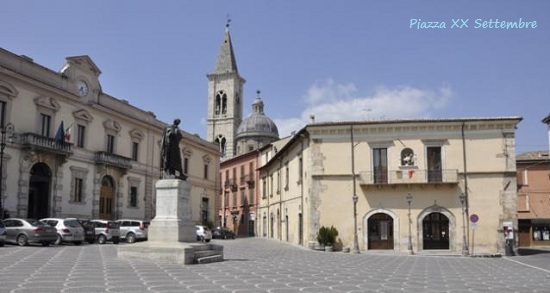 One of the earliest bishops was Saint Pamphilus (San Panfilo), an Italian pagan convert to Christianity in the 7th century who is also the patron saint and is buried in the church dedicated to him, the present Sulmona Cathedral. 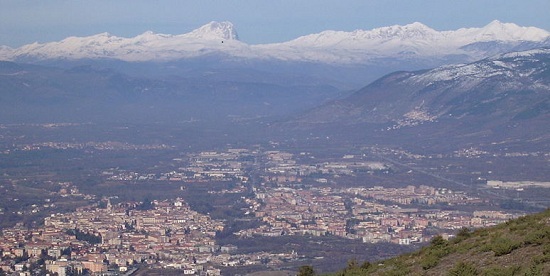 It is very well connected to Rome ( 1.5 hours - A 25 Autostrada Roma-Pescara) Pescara and other cities in Abruzzo, via train, bus and autostrada It is close to the ski resorts of Roccaraso and the beaches around Pescara. Sulmona is one of the oldest towns in Abruzzo, with many buildings from the middle ages or earlier. While much of the medieval city was destroyed by the earthquake of 1706, some remarkable buildings survive such as the Church of Santa Maria della Tomba, the Palazzo Annunziata, the Aqueduct and the Gothic portal on Corso Ovidio. Much of the city was then rebuilt in the prevailing elegant Baroque style of the 18th Century. 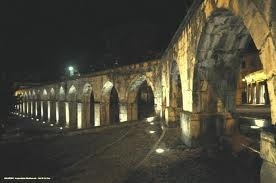 Sulmona experienced an economic boom in the late 19th Century due its railway hub and strategic geographic position between Rome and the Adriatic coast. The city's cathedral, sitting on the northwest side of the old city and was built on the site of a Roman temple. It contains a crypt which retains its Romanesque appearance despite the 18th century renovation of the main church. Palazzo Annunziata and Chiesa della SS. Annunziata. 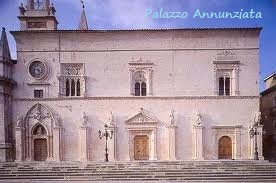 The Palace, one of the rare examples of late medieval/early Renaissance architecture in Sulmona that survived the earthquake of 1706. Its facade contains fine sculpture and tracery work. Inside the Palazzo is a museum showing the Roman history of the city as well as various artifacts. 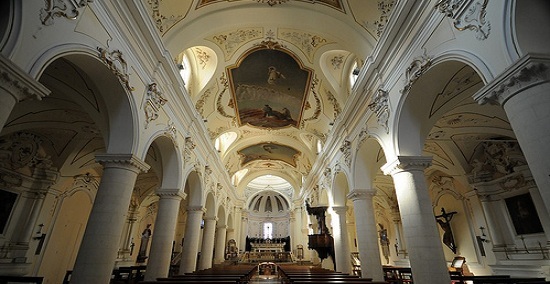 The church is a fine example of Baroque architecture with a beautiful interior. Just outside the town are the ruins of the Sanctuary of Hercules Curinus, a monumental shrine dedicated to the cult of Hercules. 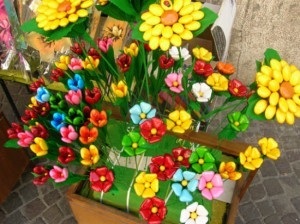 The town is heavily visited by tourists at Easter, for the pagent of the risen Christ and the rushing Madonna and the Giostra Cavalleresca di Sulmona, an ancient tradition in the town which is recreated each summer. Good Friday procession. Easter week events . La Madonna che scappa (the running Madonna). The origins of this event are uncertain. The first documentation is given by a 1861 picture preserved by the local Brotherhood association (Confraternita'), but the origins may be older, possibly dating back to 600, if not to the medieval period.The Madonna che scappa is an evocation narrative of the encounter between the Risen Christ and the Madonna ( Jesu's Mother). The Virgin Mary is accompanied by two apostles Peter and John and the statue of the Risen Christ. The statue of the Risen Christ is then positioned under the arch on one side in the town square, opposite on the other side, in the church, is the statue of the Virgin Mary in mourning. The two apostles at a slow pace are carried toward the church to announce the resurrection to the Vergin Mary. John the apostle stops halfway while Peter goes knocking at the church 's door to tell Mary who refuses to believe. (Peter is regarded as a liar due to his three denials made ​​ during Jesus's trial). Peter then goes back to John and asks him to make the announcement to Mary. The Madonna agrees to follow the two apostles and the gate of St. Philip church opens to the applause of onlookers. The three statues are now at the center of the square where the two apostles stop, while, in the distance, the Virgin recognize the Risen Son. The black mourning mantle and handkerchief fall, giving way to a beautiful green dress embroidered with gold and a red rose, while 12 doves rise in the air. At 12:00 sharp, the Madonna begins her "run" toward her son to the applause of the people, the notes of the local band, the firing of firecrackers...and viewers tear. As legend goes: Se tutto va bene (If all goes as planned), the coming year will be a good one... (tags: madonna che scappa , Sulmona). The joust of Sulmona. It takes place over two days, on the last Saturday and the last Sunday in July, during which each rider collides with four other riders for a total of 14 fights, the end of which the top four clash in the semi-finals and then in the final to win the Palio.